From Nakhchivan to Nagorno-Karabakh: What’s in a name? Earlier this week in my inbox — an email that may have been sent to Ogle Earth on the mistaken assumption that this blog is involved in some official capacity with Google:-) The missive is from an official at the foreign ministry of Azerbaijan, and it lists a series of alleged labeling errors in Google Earth and Maps. Since Google itself is a worldwide known search engine, I consider it important to inform you about mistakes noticed in Google Maps program. In particular, these mistakes are gross, and harm the interests of the Republic of Azerbaijan. Firstly, on your maps, the territory of Nakhchivan is marked as being Armenian territory. Needless to say, this is absolutely wrong, and the territory of Nakhchivan has never been Armenian. I kindly ask you to correct this mistake. The second mistake concerns the Armenian occupied territories of Azerbaijani Nagorno Karabakh region. We kindly ask you to rename Stepanakert into Khankandi, Mardakert into Agdara and Martuni into Khojavand in your maps as these regions are located in Azerbaijan’s territory and therefore cannot have Armenian names. I have to mention that Nagorno (Upper)-Karabakh is an integral part of the Republic of Azerbaijan and the whole world including USA recognises that. Moreover, it must be noticed that Armenia still occupies 20% of the Azerbaijani territory, Nagorno (Upper)-Karabakh and 7 regions of Azerbaijan beyond Nagorno-Karabakh which are an integral part of Azerbaijan Republic. Azerbaijan has the biggest number of refugees/IDPs per capita in the world. UN Security Council Resolutions 822, 853, 874, 884 on Armenian aggression against Azerbaijan are still ignored by Armenia. Please take all these into consideration and make necessary changes in Google Maps about the Republic of Azerbaijan. On the first point, Imanov is absolutely correct. 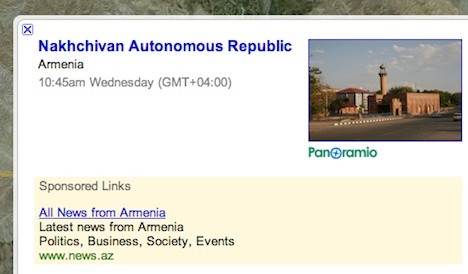 Nakhchivan Autonomous Republic is an exclave that is internationally recognized as part of Azerbaijan, but the link attached to the label for Nakhchivan in Google Earth lists it as being part of Armenia. The same goes for the other labeled cities in the region. This is a clear and simple mistake on the part of Google, and one it should fix. The “second mistake” is not a mistake, however. The primary labels for these places in Google Earth do list the Azeri version of the name. Only as “alternative place names” are the Armenian versions (in Armenian script) listed. This is in keeping with Google’s policy (as far as I can discern it) to also provide alternative names of places if they are in wide use locally. In the case of the Nagorno-Karabakh region, those villages listed by Imanov have traditionally had Armenian populations, and those populations themselves have used the Armenian names, even though the territory is internationally recognized as being part of Azerbaijan (albeit occupied and administered by Armenia since the war of 1988-94). 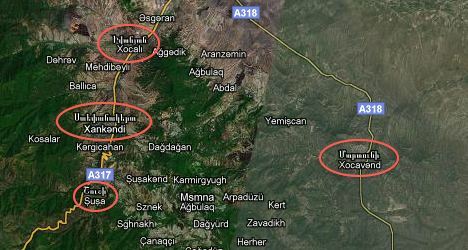 In fact, in Google Earth, only Xank…ôndi, the capital, also gets an Armenian alternative label (“’ç’ø’•÷É’°’∂’°’Ø’•÷Ä’ø”, transliterated as “Stepanakert”); the other towns mentioned by Imanov do not. In Google Maps, the Armenian alternative name is also listed for Xank…ôndi and Xocav…ônd and a few others, though with the Armenian coming above the Azeri. Perhaps this is what got Imanov’s goat? (Perhaps alternative names should go below primary names in Google Maps in the future). Imanov is correct that in addition to Nagorno-Karabakh a further 9% of Azerbaijan has been occupied by Armenia as a result of the war. Currently, Google Earth does not show the borders of Nagorno-Karabakh, but that is because Google’s geographic dataset does not currently include 1st- or 2nd-level administrative borders inside Azerbaijan (or Armenia). I hope such information is added one day, as well as the de facto line of control between Armenia and Azerbaijan. Such a line of control would presumably be colored orange, taking its cue from the line of control between India and Pakistan in Kashmir. Imanov might conceivably protest at the addition of a line of control inside Azerbaijani territory, but I’d argue that orange lines draw attention to frozen conflicts, and that this can only help Azerbaijan’s efforts to publicize the perceived injustices of Armenia’s occupation of its territory.